You can only go about three days without water. Drinking contaminated water can bring things to a close much quicker than that. In order to provide clean drinking water for our families in times of crisis, it is important to understand which are the best survival water filters. Hopefully, this article will help you choose the best survival water filter for you and your family. There are a number of things to consider when buying a filter including size, convenience, lifespan, pore size, flow rate, and price. If you are going to be primarily using a filter around your home in times of crisis, size may not be an issue. If you have a family that will be relying on the filter, lifespan and flow rate are going to be important. Pore size needs will differ depending on your water source and local environment. As we mentioned in some of our other articles, make sure you filter the water through a cloth, t-shirt or other material that can remove large particulate matter from the water. This will keep your filter from getting clogged and help extend the life of your filter. You shouldn’t skip this step even if you have the best survival water filter out there. Pump style filters have been around for quite a while and are among the most expensive filters on the market. They can be bulky but for their size, you get a filter that can pull water from very shallow sources, something that the other filters types can’t do. Pump style filters are among the most effective filters with very small pore size but do require a decent bit of energy to pump and will require field maintenance from time to time. Any decent pump filter will remove most biological contaminants and can filter water pretty quickly. Expect to be able to treat about 2000 liters before needing to replace the filter. Depending on your situation, survival is sometimes a lazy man’s game. In comes the gravity filter. This filter consists of a dirty water reservoir, an inline filter, and a clean water reservoir. Gravity filters function by hanging the dirty reservoir anywhere above the clean reservoir and letting gravity do its thing. The sacrifice is that often the reservoirs are frustrating to fill and treatment can take longer than a pump style filter. Maintenance is pretty simple but must be done frequently to keep the filter flowing well. Expect to get somewhere around 1500 liters before the filter needs to be replaced. The squeeze filter is a sort of hybrid between the gravity and straw filters. Currently, the market is heavily dominated by Sawyer products, specifically the Sawyer Mini and Sawyer Squeeze. Both are small, lightweight options. They are easy to use but flow rates are limited by the size of your dirty water reservoir and top out well below the pump style filters. The lifespan of squeeze filters is frankly astounding with the Mini offering around 100,000 gallons and the Squeeze close to a million. The prices are very affordable being around $20.00 for the Mini and not much more for the Squeeze. The filter element is not replaceable but for the price, you just replace the whole unit. These must be kept clean in the field or flow rates will drastically suffer. 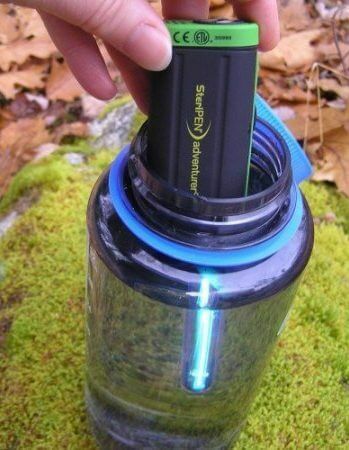 Many people consider the Sawyer Mini to be the best survival water filtration system on the market. Made popular by Lifestraw, these filters were designed with the idea of ease and convenience. For straw type filters, you simply stick one end in your water source and drink. For a bottle, you fill the bottle straight from a source and drink through an integrated cap and filter. These are on par with other filters for pore size. One of the most limiting factors is that neither of these filters is capable of producing clean water for cooking or other needs. The lifespan of the filters range somewhere between 1000 and 5000 liters and will need to be cleaned between uses. Note that these are really a one person option. If you have a family, you may need multiple filters to fill their needs. Straw and bottle style filters are often a great choice for a bug out bag and are some of the best survival water filters there are. Ultraviolet treatment devices are less of a filter and more of a purifier. These are the only option that is capable of neutralizing viruses which can be a huge benefit. They will treat all pathogens in water but do nothing for chemicals or other contaminants. These are the only treatment system that requires power but as long as you have batteries and the bulb lasts, you can treat water without concern for capacity. They are somewhat limited in the amount they can treat at once but treatment only takes about 90 seconds. Just ensure you have decent water to start with. That answer will depend on your local environment and your personal needs. If you plan to carry the filter on long treks, the lighter filters like a straw or squeeze filter may be your best bet. If you are treating water for multiple people, a gravity or pump filter may be the choice for you. Regardless of which system you choose there are a few points to keep in mind if you’re looking for the best survival water filter. None of the filters above treat for chemicals in the water so choose your source wisely. With the exception of UV option, none treat for viruses. In North America, waterborne viruses are very rare but in other parts of the world, they can be a concern. Perhaps combining a UV filter with another system may be your best bet. And remember, when the water is suspect, boil it! Can filter up to 100,000 gallons of water! One of the most versatile filters on the market. Thin body makes it feel fragile. Some of the set up options could be easier to use. The Sawyer Mini Water Filtration System is a no-brainer if you’re looking to get a great water filter for very little money. They even come in a four pack so everyone in your family can have their own. 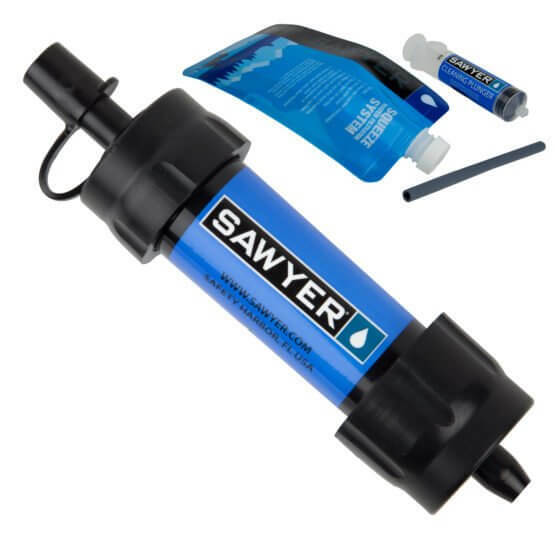 You can find our Sawyer Mini Water Filtration System Review here. Good for a group of people. Can filter 2,000 liters before the filter elements need to be replaced. Charcoal secondary filter to remove chemicals. The handle feels somewhat weak. Needs to be disassembled and cleaned periodically. At 1.5 lbs, the weight could be a concern for some. 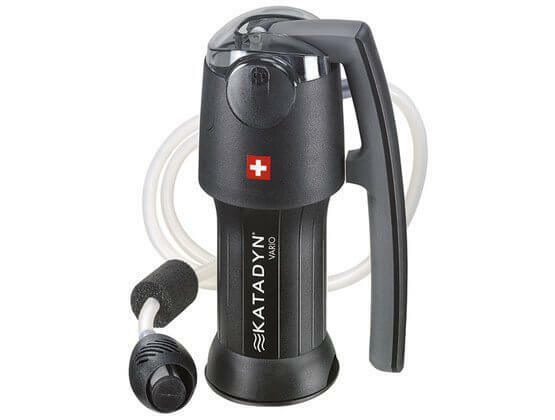 The Katadyn Vario Dual Technology Microfilter is a midsized pump style filter that is perfect for a group of people. The activated charcoal filter also allows it to remove some chemicals that other filters can’t touch. Make sure you read our Katadyn Vario Dual Technology Microfilter Review. 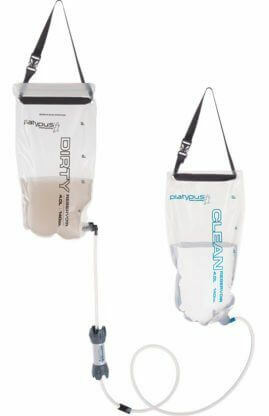 The Platypus GravityWorks 4.0 Liter High-Capacity Water Filter is a great option for camping or other areas where you don’t want to take a Big Berky with you. It really shines when it’s used by a large group of people. You can read our full Platypus GravityWorks 4.0 Liter High-Capacity Water Filter Review here. Choosing the best survival water filter can be one of the most difficult things to do in survival! Did this article help you choose the best survival water filter for you? Let us know in the comments section below. Are you interested in more survival and prepping gear articles? Make sure you head over to our gear page and see what we have to offer. I like that you pointed out that the best water treatment system for each family will be based on the condition of the environment around them. With that in mind, I will be having the water in our area checked first before I buy a treatment system this coming weekend. In my observation, the area that we are living in is quite clean since it is a newly constructed village.